Randy Davis was one of five pilots that got Nancy Writebol to Emory. One of the pilots who helped fly Nancy Writebol from Liberia to Atlanta has opened up about the experience of getting such a "special passenger" back to the U.S.
Randy Davis is one of three captains who piloted the private plane today from Liberia to Maine where it stopped to refuel. Davis said that he was not nervous about his proximity to the contagious patient, who he referred to as their "special passenger," and said that he viewed it as an honor. "I think everybody everywhere would agree that you'd like to try to help people who are so selfless," Davis said to ABC News. "In any job when you can help some people first hand and see what they have done and even meet some of the family members it certainly is a gratifying experience." He said that, aside from the special isolation precautions taken as a result of Writebol's Ebola diagnosis, the flight was fairly typical. Davis said that he was able to meet Writebol's husband David, who also works with the same charity as his wife, SIM USA. David remains in Liberia at the moment but there are plans to get him back to the U.S. at some point this week. Writebol's contagious condition meant that Davis was unable to interact with her at all during the flight, but he did get a chance to speak to her husband while at the Liberian airport. Davis said he was "most gracious" and a "caring gentleman." (U.S. Centers for Disease Control) The ABCS protects the flight crew from the possibility of being infected by the patient. After taking off from Monrovia, the plane's first stop was at a Portuguese air base off the coast of Africa. "We did not even get off the plane there, we just refueled," he told ABC News. 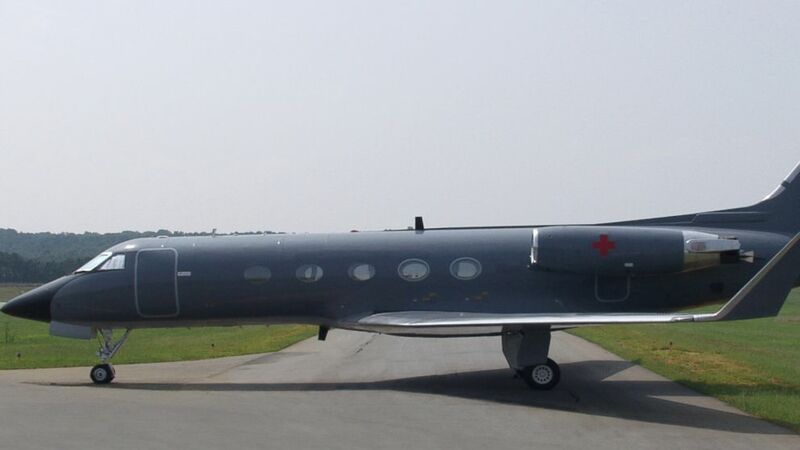 From there, the plane flew to Bangor, Maine, which the private air company Phoenix Air Group regularly uses as a stop on such long haul flights because they can clear U.S. customs there as well as refuel and swap out pilots. Davis was one of three pilots who rotated throughout the first leg of the journey from Liberia to Maine, and then once they reached the base in Bangor, one of those three pilots got off the plane and two others joined to take over the helm for the final portion of the trip from Maine to Georgia. The only other individuals on the plane were three medical personnel hired from a company that regularly works with Phoenix Air Group and Writebol. For his part, Davis said he has worked as a pilot for 40 years and for Phoenix Air Group for 23 years. 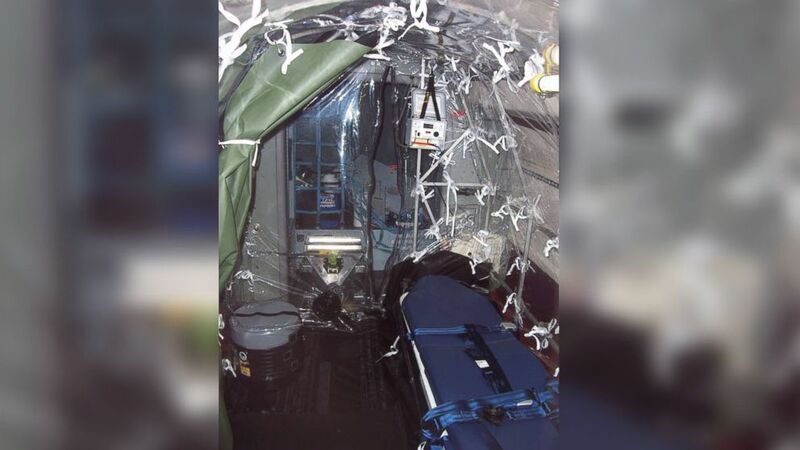 (U.S. Centers for Disease Control) The device is loaded onto a private jet and can be used to take infected CDC personnel to get medical care. Davis said that while the pilots were briefed on the patient's condition, they were not given explicit care instructions, which he said is typical in most medical evacuation flights -- especially this one since the "special passenger" was kept in an isolation chamber throughout. "We could see it back there but it's really not in proximity to us," he said of the CDC-approved isolation chamber Writebol was kept in throughout the journey. The same plane was used when Dr. Kent Brantly was flown from Liberia to Emory University Hospital on Saturday, but Davis was not part of that flight crew. Though he did not have to wear any special protective garments since Ebola is not an airborne disease, the medical personnel wore hazmat suits that were kept in their own section of the isolation container. The CDC confirmed today that they had received at least 100 complaints from individuals upset about the prospect of purposefully flying Ebola-infected patients into the U.S., but Davis, who lives in Georgia, said that he is not worried about the spread of the deadly virus. "It certainly seemed the like the best medical care in the world to maximize the recovery for these folks would be here at the CDC at Emory Hospital," Davis said. "I think pilots and people in the aviation industry are fact-driven and rationality-driven. That’s what we call go upon and in this particular matter it does not appear to bring any undue risk to the people around the hospital," Davis said.